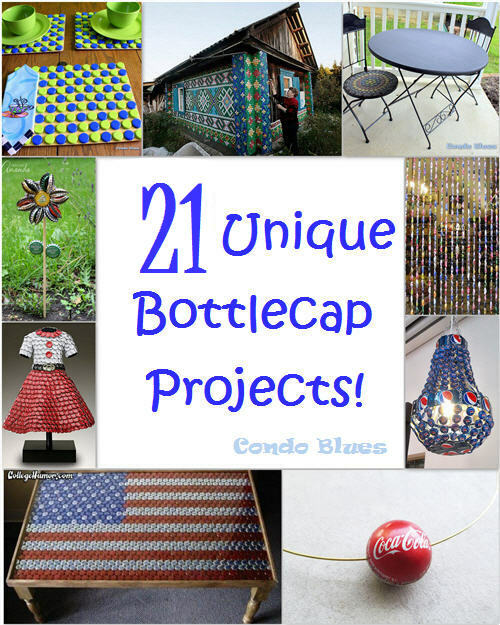 Condo Blues: 21 Unique Bottle Cap Crafts to Inspire You! 21 Unique Bottle Cap Crafts to Inspire You! I remake and makeover a lot of things using bottle caps but as our collection grows I need new recycled DIY ideas. I can’t be the only one that doesn't this, can I? Pint this post for later! 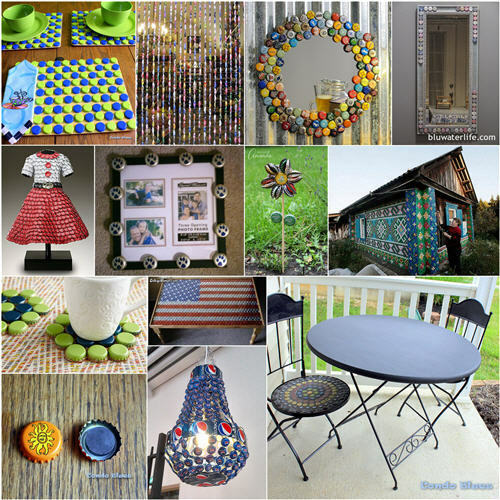 I thought I’d share the bottle cap craft love and show you some of my favorite recycled bottle cap projects from around the web to inspire you. You can just drool over them like the bottle cap house. I doubt my Home Owner’s Association will let me do that or Husband for that matter. 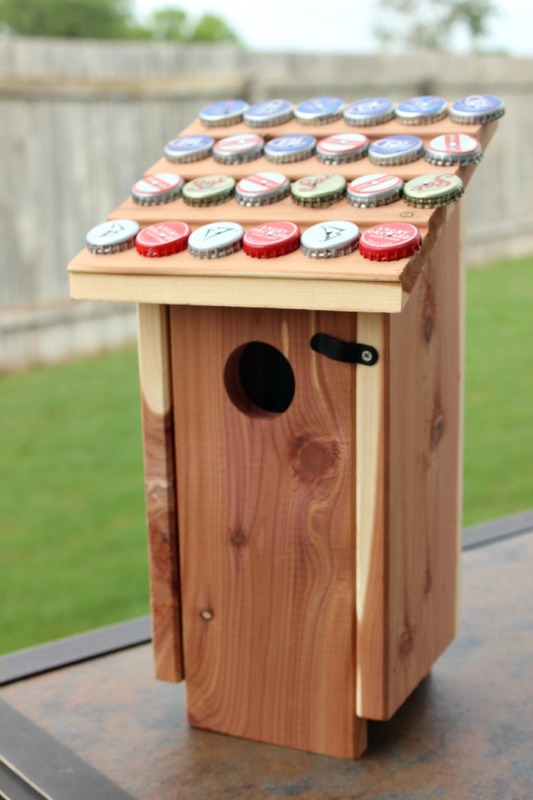 17 Recycled DIY Bottle Cap Décor Projects We Love! 5. Bottle cap Dress – blog for everyone I can’t tell you how much I love this and want it in my house! 6. Dog Paw Bottle Cap Picture Frame – Condo Blues My very first creative reuse bottle cap project. 8. Plastic Bottle cap Mosaic House – Express-o Wow! What commitment! 11. 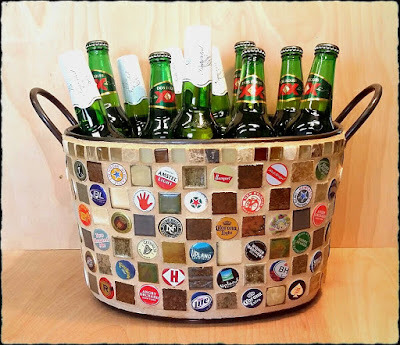 Bottle Cap Mosaic chairs – Condo Blues I can’t tell you how many compliments I get on this creative bottle cap project. 12. Bottle Cap Magnets – Condo Blues A quick and easy DIY project that practically makes itself! 14. 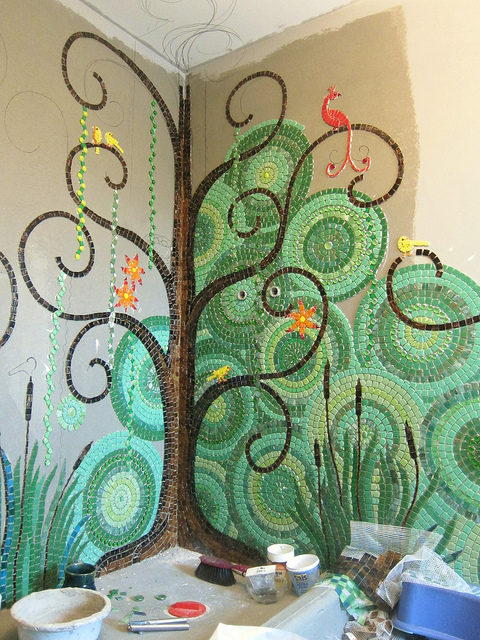 Bottle cap Bathroom Mosaic Walls – Frances Green – I cannot tell you how much I love her mosaic bottle cap walls. Fantastic! 15. 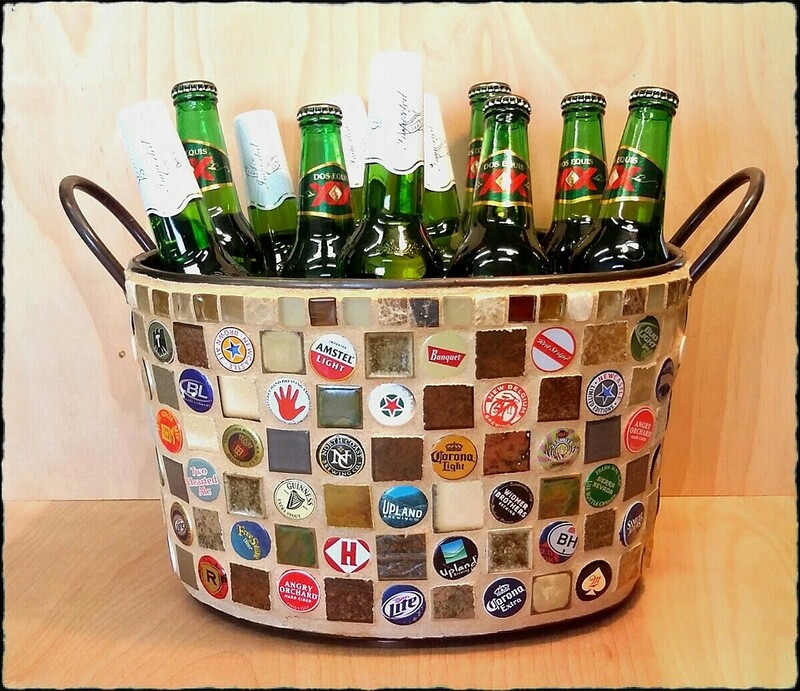 Funky Beer Bucket – Mosaic Garden. This one is a to buy rather than I DIY. It is so so worth the price! The copper makes this piece sing! 16. 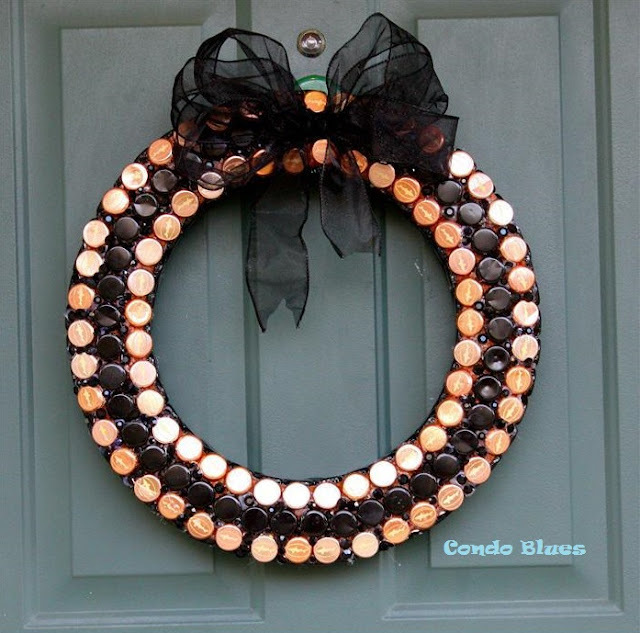 Copper Bottle Cap Wreath – Condo Blues Recycling projects can add a little glam to your décor! 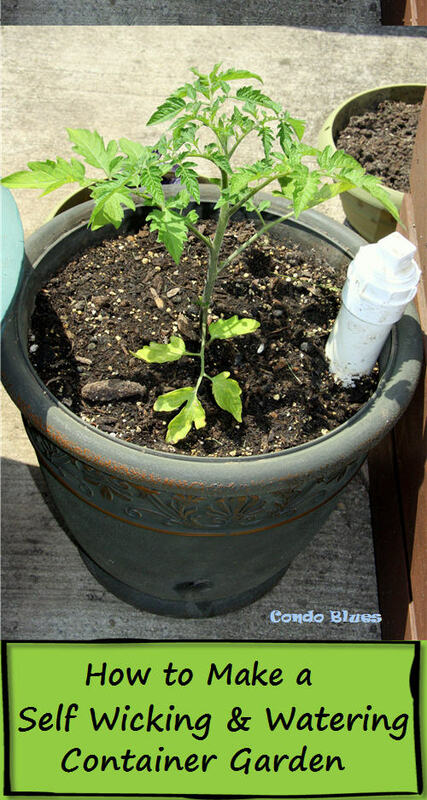 A fun bottle cap project for kids! 18. 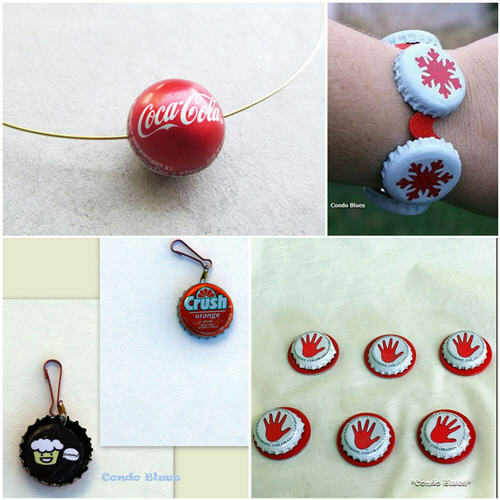 Domed Bottle cap Bead Necklace – Instructables I want to learn how to make these. So cool! 21. Bottle Cap Pattern Weights – Condo Blues Well, you can’t actually wear this project but you can use them to sew something to wear and that’s close enough. Do you collect bottle caps? 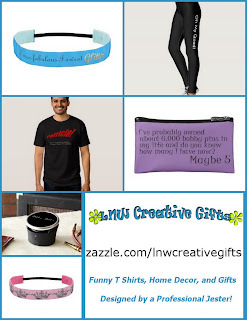 What do you do make with them?